Yesterday was another of those days set aside for driving. We didn't actually make tracks until after midday. It wasn't the most scenic drive we'd been on, and as we made our way west from Timaru, further towards our goal for the day (Mt Cook), the sky turned grey and the rain began to come down. Eventually, I decided I'd had enough of squinting through the windscreen and found somewhere to pull over for the night. It was gonna be a cold night without a heater, but we had made good progress - at a conservative guess, we were probably only 30km from the nearest point to Mt Cook by road. In case you are not aware, Mt Cook is the largest mountain in the Southern Alps, and most mountain climbers from this part of the world aspire to get to the summit. Unfortunately quite a few have died in the process of getting there in the last few months and years. We certainly weren't going to have a problem on that front (as we had no intention of climbing to the top!) - our greatest worry was running out of petrol. So, this morning we woke up not knowing what to expect of the weather. One thing you can say about New Zealand is that the weather is unpredictable, so perhaps we should not have been surprised to wake up to clear skies above us. What was a surprise was that we also had some snow to look at - the rain that we were getting must have been a lot colder higher up. At last! Every time we'd seen mountain ranges so far, there was no snow. Now, on the day that we were heading to see Mt Cook, the snow had arrived and the sky was blue. I couldn't have asked for better conditions. 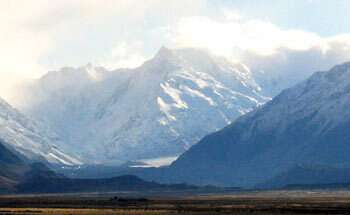 Mt Cook, South Island's biggest mountain. We continued our drive into the mountains, stopping regularly on the way as each new white, snow-dusted peak was revealed to us around each bend, eventually reaching the end of the line - an alpine village that surrounds a hotel/complex called The Hermitage. 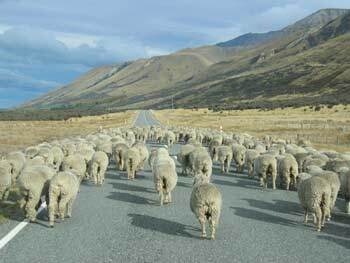 We didn't even have time for a cup of coffee before getting ourselves booked on to a morning tour, a 4-Wheel Drive trip up into the Tasman Valley. We found ourselves with 9 other tourists - all Japanese - and our guide/driver/resident joker Alan all squished into an old Toyota 4WD. Behind the car Alan was towing a vehicle with 8 little - but spongey-looking - wheels that he called an Argo. It looked like a kids toy, but we were later proven wrong. Alan's Argo - a surprisingly hardy little vehicle. Alan is a real character. At 76 years old I'm not sure if I'd want to be doing this tour twice a day, but he'd not lost his sense of fun in any way. He certainly knew how to give the Japanese tourists a good chuckle (it turns out that 80% of his clients are Japanese, so he's had plenty of practice). We managed to get a certain distance along a stoney track before it got too steep and rugged for the 4WD, and Alan got the 8-wheeler off the trailer. Did I mention it looked like a toy? Well, it certainly didn't handle like one! It was very deceiving - in this little vehicle you can get up some very steep inclines with rocks jutting out that would make most Land Rover owners have second thoughts (not that many of them actually take them off road, but that's another story); it can also turn on a dime, literally spinning on the spot (when the chain-driven wheels on each side are put in opposite directions). We ventured further up a path (of sorts) and then came stage three of the trip - a clamber up a rocky wall, beyond which we were treated to clear views of Tasman Glacier (or the tail end of it), Tasman Lake and the range of mountains directly opposite. Alan had a bit of fun with us all, as he no doubt does on every tour, getting us all to shout "hello!" across the valley, just so that we could hear the echoes. 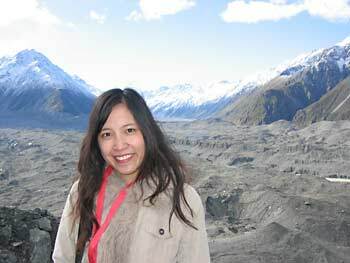 Manda in Tasman Valley, Tasman Glacier in the background. 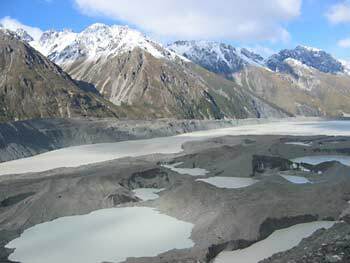 Lake Tasman - the result of the melting glacier. We then made our way back, once more in the nippy little Argo and 4WD, just as it started to rain. As we came around Tasman Valley and back up towards the Hermitage we could see that the rain was getting worse, particularly over Mt Cook. We had seen it on our drive in to the area earlier, but now all we could see was a white-out. The wind was picking up too - the rain was almost going sideways. We considered ourselves lucky that we'd opted for the 10am tour and not the 2pm one. We asked Alan whether he has anyone else help out during the busy season. "Oh yeah," he says, "I've got someone who helps out part-time. Young fella. 72, recently had a hip operation." It didn't strike me that there was any succession plan to 'Alan's 4WD Tours'.